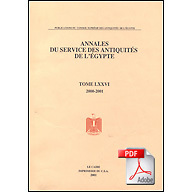 Digital Giza | Annales du Service des Antiquités de l'Égypte 76 (2001), pp. 65-72, "The Senedjemib Complex at Giza: Report on the February-March 1999 Field Season of the Giza Mastabas Project"
Brovarski, Edward. "The Senedjemib Complex at Giza: Report on the February-March 1999 Field Season of the Giza Mastabas Project." Annales du Service des Antiquités de l'Égypte 76 (2001), pp. 65-72. Remarks Son ([sA=f smsw] his eldest son) of Akhetmehu (owner of G 2375); owner of secondary chapel G 2375a (abutting east face of G 2375). False door inscribed for Ankhirptah, identified as [sAb r nxn] judge, mouth of Nekhen; in situ in secondary chapel G 2375a. Also appears in chapel relief in tomb of his father G 2375, north wall of chapel recess (marsh scene, depicting Akhetmehu and Hunetka and their sons Ankhirptah and Seshemnefer), identified as [sAb sS] juridicial scribe; south wall of chapel recess (including displaced blocks 35-11-96a and 35-11-96b, standing figures of Akhetmehu and Hutnetka and son Ankhirptah receiving tribute), identified as [sAb] judge; one face of each displaced pillar inscribed for Ankhirptah, identified as [sAb smsw hAjt] judge, elder of the court; displaced pillar originally from G 2375 pillared portico (reconstructed), relief in situ in G 2375. Remarks Wife ([Hmt=f] his wife) of Akhetmehu (owner of G 2375). False door inscribed for Hunetka, identified as [rxt nswt mrt nTr Hm-nTr HwtHr] royal acquaintance, beloved of the god, priestess of Hathor; found displaced in court of G 2375. Also appears in chapel relief, north wall of chapel recess (marsh scene, depicting Akhetmehu and Hunetka and their sons Ankhirptah and Seshemnefer), identified as [rxt nswt] royal acquaintance; south wall of chapel recess (including displaced blocks 35-11-96a and 35-11-96b, standing figures of Ankhetmehu and Hunetka and son Ankhirptah receiving tribute); in situ in G 2375. Name and titles (including [Hm-nTr HwtHr nbt nht] priestess of Hathor Mistress-of-the-Sycamore) appear on displaced inscribed block, along with those of her husband Akhetmehu; found in chapel of G 2375 (possibly originally from south wall of chapel recess). Remarks Son ([sA=f] his son) of Akhetmehu (owner of G 2375). Appears in chapel relief, north wall of chapel recess (marsh scene, depicting Akhetmehu and Hunetka and their sons Ankhirptah and Seshemnefer), west wall of chapel recess (north of false door, Akhetmehu seated at offering table with Seshemnefer leading row of offering bearers below), identified as [sAb sS] juridicial scribe; in situ in G 2375. Remarks Egyptologist and co-director of the Cairo University-Brown University Excavations (CBE) in the Abu Bakr Cemetery. Remarks Egyptian antiquities service; precursor to Supreme Council of Antiquities.